My name is Quincey. I attacked a 120 lb. Mastiff. I scared him so badly he cried and peed all over the floor! I am only 6 lbs and I only have 2 teeth left! Mommy was embarrassed. I was proud! My neighbor’s pit bull is scared of my 15 lb shih tzu. He looks quite proud of himself with that little smirk, ears folded over forward and chest sticking out! The neighborhood dogs will back off when they see you coming….your too cute Quincey! My former six pound dog, Crystal, took on a 120 pound newfie with the same results. My 55 lb. German shepherd/rottweiler mix tried to take an an easily 200-250 lb. Great Pyrenees at the vet, yet was terrified of the 3 Boston terriers next door. No. concept. of. size. Little dog, big personality, huge …………… cojones! my 150 lb mastiff had the exact same reaction when a dog about that size came into our yard one day and chased him inside, mid-pee. once he was safely inside he got big again and barked at the little dog through the window. What utter drivel. I bet you’d whine if said big dog stood it’s ground and used your little rat as a chew toy. Yes, thank you. 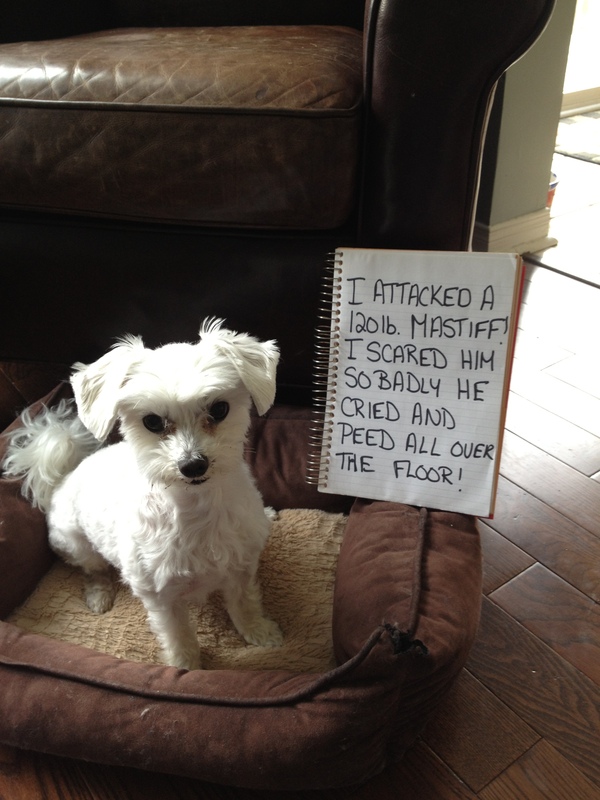 I hate when people think its okay for small dogs to be aggressive just because of their size. Little dog syndrome… My aunt had a dachund and a doberman… Guess who thought she was a tiny lap dog, and who ruled the house, lol. My mom’s 80 lb purebred German shepherd is a wimp when it comes to my sister’s 16 lb cat. The dog is 2 years old, the cat is 17 years old. One day the dog bounded into the house spotted the cat and nudged her with a cold wet nose which the sleeping cat didn’t appreciate and let it be known with a swipe of claws ever since when she sees my sister cat she’ll hide behind my mom’s knee and peek out. People think a young healthy dog terrified of an old fat cat is the funniest thing they’ve ever seen.